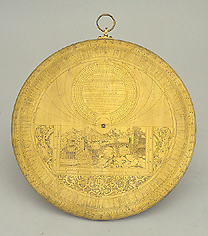 Johannes Praetorius (1537-1616), the latinised name of Johann Richter, professor of mathematics in Vienna and Prague and the maker of interesting mathematical and astronomical instruments, is the author of this extremely fine astrolabe, which is now incomplete. The instrument lacks its rete, alidade, rule and some of its plates. The one surviving plate is calibrated for the latitudes 53 and 57?, which cover an area roughly corresponding to Great Britain. On the back of the instrument, the most important religious festivals are indicated. The instrument also bears the zodiac calendar and the principal saints. The shadow square is also present, and frames an artistically engraved rustic scene.